The ride is scheduled for September 2, 2018. This is the 8th Annual TAMBA Rose to Toads Ride. Mark your calendars, start your training, and make sure your TAMBA membership is up-to-date to get first dibs on registration and shuttle spots. Proudly brought to you by TAMBA, in partnership with the U.S. Forest Service Lake Tahoe Basin Management Unit. A Forest Service Special Use Permit has been issued for this ride! 2015 was first ever legally-permitted Rose to Toad’s event, which means this is more than just a group ride. In 2015, 2016, 2017 we were able to raise about $16,000 for trail maintenance and building. From humble beginnings with a handful of people to nearly 200 participants and a full-on party scene at the rest stops in recent years, this event has come a long way. The “unlimited bragging rights” you get for finishing this beast are legit! PLEASE NOTE, THIS RIDE IS STILL COMPLETELY SELF-SUPPORTED SO BE PREPARED! Over 62 miles in length with 8,000+ feet of climbing and 10,000+ feet of descent, this is the most amazing (and tough) mountain bike ride. What started off as a hair-brained idea with a few friends many years ago, before TAMBA’s rebirth, is now one of our signature events that attracts crazy people from all over the country. It takes most people all day to complete the ride and showcases some of the best trails linking Lake Tahoe’s North Shore from Mount Rose down to the South Shore, ending on the famous Mr. Toads Wild Ride. It’s not a race but the ride can be as intense as you want it to be. Join us and be part of something awesome! DISCLAIMER: This ride is self-supported. There is no sweep or sag and you need to be prepared for anything. For 2018, we will have two rest stops along with a finish-line celebration. The Tahoe Rim Trail Association will be at the Spooner rest stop and another rest stop will be just after Kingsbury Grade. Click on the Trailforks map below to view a full map or to download a GPX/KML file of the route. Start of 2013 Rose to Toads with a fresh dusting of snow on the ground. What bike should I ride? The ideal bike has gears, weighs around 30 lbs. or less, and has between 4” to 6” of suspension front and rear. How long does it take to ride from Mount Rose to Mr. Toads? Fast times are about 8-9 hours, average times are around 10-11 hours, and some people finish in the dark. Do we ride together as a group the entire time? No, the ride gets spread out pretty fast and not everyone starts at the same time either. You’ll probably leap frog with people and find a comfortable pace with a few other riders who want to be social. Do I have to ride all the way to Toads? Of course not, this is a fun ride and there are many options to ride back down to lake level sooner than Toads. What do you mean by a self-supported ride? There is no one out there that will save you if your bike explodes or you get hurt, there is no sweep or sag to pick you up. Please carry everything you need to fix mechanicals, extra food and water. I heard there are rest stops, where are they and what’s at them? We have two rest stops along the first half of the ride, the first will be at Spooner Summit on the west side of Highway 50 in the Rim Trail parking lot, the other will be just past Kingsbury Grade in the parking lot of Heavenly’s Boulder Lodge. We’ll have a variety of sweet and salty snacks along with drinks. There will not be any more rest stops and only limited access to mountain water (a lake and a few streams) after you get back on the Rim Trail at the Heavenly Stagecoach Lodge. What should I pack? Here’s a link to photos of a few pack contents from past years. Be prepared! Also, there is very limited phone service along the route. Bring a print map if you don’t know the route and ride along with others. Do you have a map of the ride and gps track? Yes click here to download a pdf map. How well marked is the route? There is standard trail signage and a few temporary signs specific to this ride at key intersections. That said there are a few variations on the ride, so know where you’re going. Ultimately if you stay on the Tahoe Rim Trail heading south you will get to Toads… eventually! The one exception to this rule is between Tunnel Creek Road and Spooner Summit where the route departs the Rim Trail, drops down to the Marlette Flume Trail to follow a smooth, flat route to Marlette Lake. The route then follows the North Canyon Road from Marlette Lake to Spooner Lake, then joins the Rim Trail at Spooner Summit on US-50. Follow the Rim Trail for only another 40 miles to the top of Mr. Toad’s Wild Ride (aka Saxon Creek Trail). Why does TAMBA put on this ride? Wouldn’t this be the most awesome Enduro race ever? 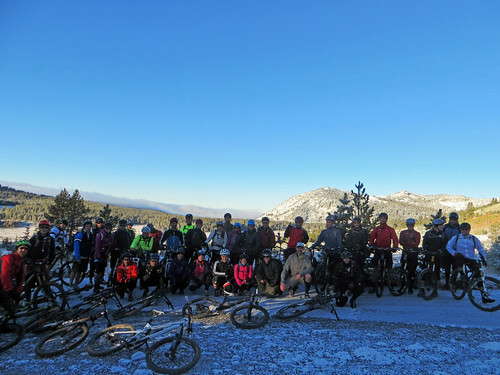 We put this ride on every year as a member benefit and to showcase the amazing riding in Tahoe. Please be courteous to all other trail users, this is not a race! Tell them what you are doing and how badass it is. Have fun! We want to create lasting experiences. Where to Stay Hotels/Motels : Check here for a list of hotels. We recommend the following hotels: Inn By the Lake Cedar Pines Resort Motel 6 (dog friendly) Tahoe Seasons Resort, Tahoe Beach Retreat.